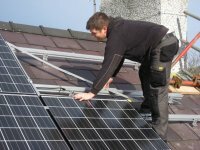 Solar Panels Installation Guide: To help you understand a retrofit installation of solar photovoltaic panels we have broken it down into its individual stages. If you would like more information about solar panel installations or would prefer to speak to someone you can contact us on 01494 773400. 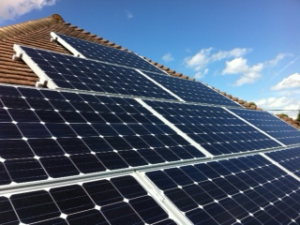 All of the Solar panels in our range use a solid aluminium frame to encase the individual solar cells. Aluminium is light and strong and stand up against the elements, this gives the panels a rigid shell and allows them to be screwed or clamped securely to your roof. Panels vary in weight between 13 and 50kg depending upon their size and manufacturer. 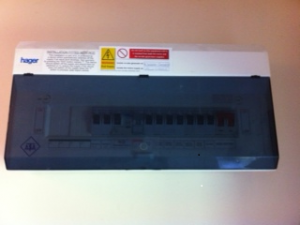 For the panel specifications of all the panels in our range see our Solar Panels pages. Roof anchors are aluminium or steel components that screw directly into the rafters, forming the base of the mounting system. The type of anchor used is determined by the characteristics of the existing roof tiles and the height and spacing of the roof batons. The majority of the anchor fits under the tiles with only a small proportion of its tail visible. It is to this tail that the frame is attached. Once the roof anchors are secured in place the frame is attached to them. This attachment is made using a specially engineered locking system to ensure there is no movement and then tightened using conventional bolts. The frame consists of two parallel aluminium bars for each row of panels. The panels sit directly on the frame and attached by clamps. There are two varieties of clamp; end-clamps and mid-clamps. 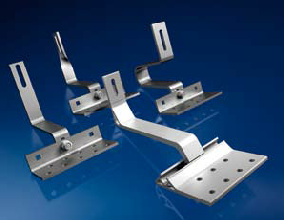 End-clamps are situated at the end of a row of panels, thereby helping to secure one panel. Mid-clamps are used between panels to help secure two panels in place and ensure there is equal spacing between them (usually 20mm) for aesthetic reasons. At least 4 clamps are used to secure each solar panel to the mounting frame, with different clamps being used for each brand of solar panel. Now that the components required for the installation have been laid out, the installation process itself can begin. Roofs are very rarely exactly ‘straight’. Inevitably the ridge, the eaves and the ground will not run perfectly parallel to each other. The installation looks best when the panels run parallel to the edge that is nearest them, which is usually the eaves. We recognise that after performance, aesthetics are the most important aspect of a solar photovoltaic installation and so our installation teams will ensure this to be the case. 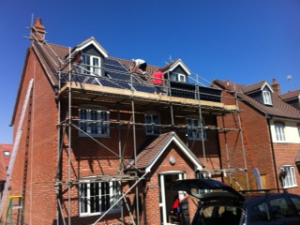 We will arrange to have scaffold erected by locally sourced trained specialists. Depending on the expected length of the job this will either happen before or during the morning of the first working day.The scaffold is erected to reach the eaves of the roof and ensures the safety of those working on the roof with compliance to all relevant Health and Safety codes. 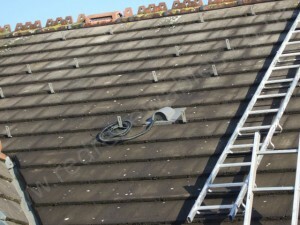 Ladders from the scaffold across the roof are used when the roof tiles are slippery or fragile. It is important that the roof anchors are positioned carefully on the roof to ensure the solar panels can be installed correctly. The location of the rafters under the existing roof tiles are identified, to which the roof anchors will soon be screwed. The anchors are then placed on top of the tiles where they will eventually be positioned while measurements are taken to ensure that the aluminium frame will sit ‘straight’. Once the position of the anchors is determined they can be fixed to the roof. One roof tile is removed to allow the anchor to be screwed to the rafter and then replaced to ensure the roof remains watertight. It is important that the correct type of anchor is used and this would be determined during the site survey. Once all the roof anchors are fixed into place, the aluminium bars that make up the frame are then locked into the anchors and screwed into place. Each bar is checked to make sure that it is straight and that all the bars are parallel to each other. This is the single most important step in ensuring that the panels will look correct. If the length of the frame is longer than the aluminium bars supplied then they are spliced together using specially designed strips of aluminium and further bolts. With the bars in place, the frame is complete and the panels can start to be attached and clamped to the frame. A minimum of 4 clamps is used per solar panel, though in some cases extra clamps are used to aid the parallel alignment of the rows. The panels are either placed by row or by column depending upon which is the easiest in each specific situation. In the photo to the right the panels are being placed by row. In this case the top row is placed and the alignment of each row thereafter is taken from it. 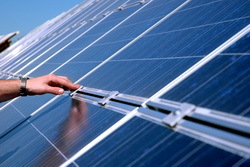 The solar panels are wired by the manufacturer, meaning the rooftop connection is straightforward. 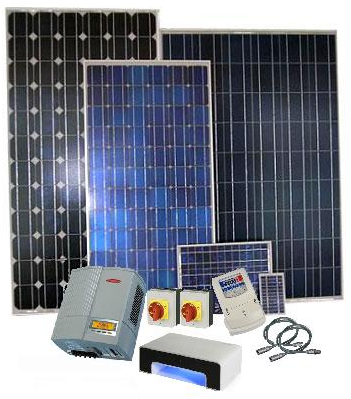 The specific voltage, amperage and power of the system determine how the panels are connected. Smaller systems connect a single series to a single inverter, while larger systems connect several parallel series into a single inverter. The largest systems may require multiple series into multiple inverters. Shading and panel positioning can also influence the design of the wiring. 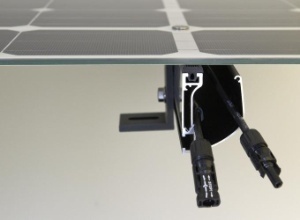 Once the top row of solar panels is correctly clamped the rows beneath are secured to the frame in the same manner, taking their positioning from the row above. 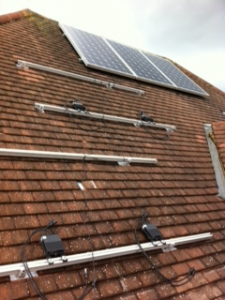 Aligning the panels parallel to the row above is extremely important in ensuring the finished system will look good. This process is made easier if the original frame is well placed, which is why our installers take care to get things right within the initial stages of the installation. Once all the panels have been installed and the alignment checked the final wiring of the system can begin. 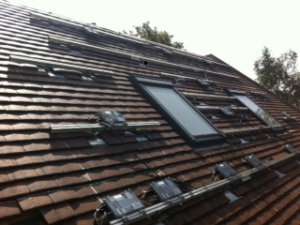 The DC wiring from the panels on the roof needs to enter the property in order to be connected to the electrics in your home. In some cases this is achieved by running the wire under the eaves and directly into the loft. In others, such as in the image on the right, a hole is made within the wall which is then sealed to ensure it is watertight. Once the wiring has reached the inside of the property, the rooftop section of the installation is complete. The inverter is usually located in your loft or garage. 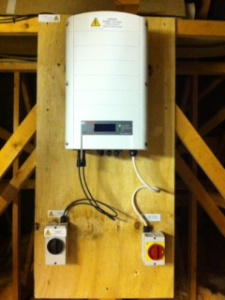 The DC cables from the solar modules are run into a DC isolator switch then connected to the inverter. The inverter should be correctly specified for the size of the array (KWp) on your roof and be compatible with the solar modules chosen. It should be positioned free from any obstructions to allow are flow and fitted to a fire retarded board which is securely fixed to structural roof members or a gable end. 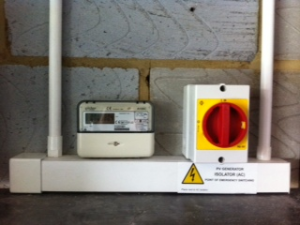 AC cable is now run down to a further AC isolator switch, through a solar generation meter and into a 16amp mini circuit breaker on the premises consumer unit. Once your system is connected to the national grid you should now be generating your own electricity.